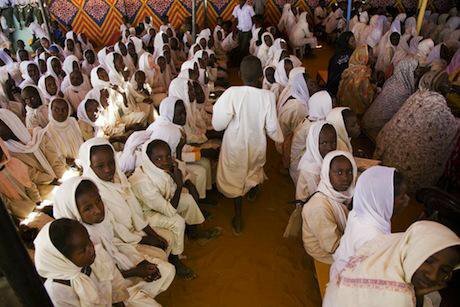 Internally displaced people in Darfur, Sudan. Demotix/Albert Gonzalez Farran. All rights reserved. The story of one individual can bring home the realities of living under a repressive regime that otherwise seem intangible. The recent story of Meriam Yehya Ibrahim Ishag, a Sudanese woman who has been sentenced to death by a court in Sudan for adultery and “apostasy”, highlights one extreme consequence of such repression. In reality, marginalisation and exclusion on the basis of gender, creed and ethnicity/race is the norm not the exception in Sudan – the majority of Sudanese are being treated like second-class citizens at best and non-citizens at worst. The circumstances that led to Meriam’s death sentence are deeply embedded in Sudan’s history, as outlined so eloquently by Hala al-Karib. For decades, the ruling elite has sought to mobilise and exploit a restrictive version of Islamic and Arab identity as a way of reinforcing the marginalisation and neglect of huge parts of the country, undermining the claims to equality of those living there. When groups on the peripheries have demanded their rights, the state has responded with unspeakable violence. The war between the government of Sudan and the Sudan People’s Liberation Army (SPLA), which eventually led to the secession of South Sudan in June 2011, is one example. The on-going conflict in Darfur and the renewal of conflict in South Kordofan and Blue Nile states are others. Alongside the horrific human toll taken by these conflicts, they have further exacerbated the economic, political and cultural marginalisation of large geographical areas of the country. While some have fled the country, others have stayed. Many have moved to the capital, Khartoum, in search of safety and economic opportunity, only to find that the same logic of discrimination that prised them from their homes has been replicated in Khartoum. And things are only getting worse. Since the secession of South Sudan, spaces for belonging – as evidenced by the ability to access one’s rights – have further contracted, hardening the fault lines that separate insiders from outsiders. Smarting from its loss of territory and resources, the state has become even more strongly exclusionary and for those excluded, their citizenship is devalued at every level. The harsh truth, therefore, is that Meriam’s plight is just one example of the way in which the government of Sudan is making daily life all but impossible for millions of people. Recent research by the International Refugee Rights Initiative with marginalised groups living in Khartoum showed that exclusion was being experienced at many levels: economically people spoke of a lack of access to services in the areas in which particular groups are known to live, with stories of deliberate diversion of services, of markets being closed down, of jobs being lost and of children being removed from schools; politically people talked of their fear of arbitrary arrest, of being refused proper identification and of their inability to express themselves; and culturally people talked of a metanarrative of exclusion. Meriam’s story is part of that metanarrative. Not only is it tragic on a personal level, it also sends a strong message to other members of the Christian community in Sudan that their faith is not acceptable, promoting the notion that only Muslims can be considered truly Sudanese. It reverses the protections found in Article 38 of the constitution, which state: “Every person shall have the right to the freedom of religious creed and worship.” At every level, therefore, marginalised groups – in this case religious minorities – are not only being made to feel unwelcome, but unsafe, calling into question the very extent to which such minorities can be considered citizens. Meriam's predicament also speaks to the particular vulnerabilities of women in Sudanese society. First, the basis for the apostasy charge against her is a patriarchal worldview: she is considered to have been Muslim not as a result of any choice of her own, but merely because her father was Muslim. Furthermore, the charges of adultery show the convergence of religious and gender discrimination: her very biology makes her vulnerable to charges of adultery (as proved through her pregnancy) and her defence, her marriage, is deemed illegitimate because of the treatment of her religious beliefs. Thus the horrific circumstances around Meriam’s arrest, imprisonment and sentencing portray a personal story of a woman’s extraordinary courage to stand up for her beliefs in the face of seemingly impossible odds. But it also gives us a glimpse into the realities of life under a repressive regime – a regime that has alienated the majority of people from a minority central power source and that has fought for control not only of political and economic resources, but also of deeper social and cultural forms of belonging – the very basis of what it means to be Sudanese.